Click To Pray is a platform that invites men and women from around the world, to accompany the Pope in a mission of compassion for the world. It has a website and a mobile app, both for Android and iOS, with its social networks, available in six languages (Spanish, English, Italian, French, Portuguese, and German). 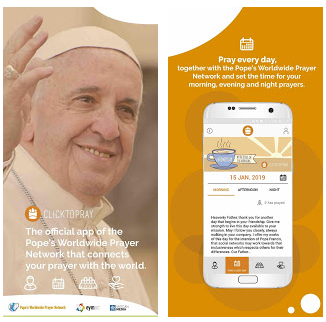 The new app, called Click to Pray was launched by Pope Francis, will inform the user what the leader of the world’s 1.3 billion Roman Catholics is praying for, such as world peace or the population of a country hit by a natural disaster, so they can join him. Click To Pray has three main sections: “Pray with the Pope”, with the Pope’s monthly prayer intentions for the challenges facing humanity and the mission of the Church; “Pray every day”, with a prayer rhythm involving three daily moments; and “Pray with the network” that is a space where users (Pope Francis among them) can share their prayers with the others. Where Can I Download Click to Pray? You can download it from Google Play store here for Android users and on iOS store here for iPhone or iPad users. Does having more people pray over an issue make God respond to it faster? Many men want to become God but only one God became man.